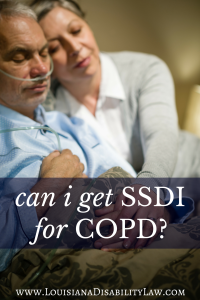 Can I Get Social Security Disability benefits for COPD? I am currently working on a New Orleans social security disability application for a client with chronic obstructive pulmonary disease (COPD). I thought it would be good to discuss how a disability claim for COPD is evaluated by SSA under the listings. COPD is a listing level disease. It is a Respiratory Impairment. It is listed at Listing 3.02(A). This means that if your medical records establish the requirements set forth in the listing then your disability application should be approved at Step 3 of the Sequential Evaluation Process. This is important because if your COPD meets the requirements in the listing, then SSA does not have to evaluate whether or not your COPD prevents you from performing past relevant work or work generally available in the national economy. What Is Required To Meet Social Security’s COPD Listing? “A. Chronic obstructive pulmonary disease, due to any cause, with the FEV1 equal to or less than the values specified in Table I corresponding to the person’s height without shoes. FEV1 is defined as the forced expiratory volume at one second – that is – it is the amount of air a person can exhale (blow out) in one second. If you are close to meeting or do in fact meet, the FEV1, you are in pretty bad shape health wise. The values SSA uses for the FEV1 analysis are considered low because SSA is erring on the side of caution. Claimants who have COPD usually cannot tolerate dust, smoke, or fumes and can have problems with extreme temperatures or humidity. COPD usually results in an exertional impairment. The full extent of the exertional impairment will have an impact on whether your COPD qualifies for disability. Many disability applicants with COPD are older than 50 and thus, fall onto the grids. Winning disability for a claimant younger than 50 with COPD is difficult unless the COPD is termed as moderate or worse (and often severe or worse is required) and results in significant exertional impairments. Social Security will also look at your longitudinal medical record (your medical history over time) to determine whether treatment provides any functional recovery. If you do not have a regular doctor or receive regular medical care despite your COPD, you may not be able to meet the listing, but may be able to equal the listing or show functional limitation sufficient to qualify you for benefits. Typically, if you apply for social security disability alleging Chronic Obstructive Pulmonary Disease or another respiratory ailment, SSA will send you for a consultative examination. At this CE, the doctor will perform a spirometric pulmonary function test. This test measures your FEV1. SSA has developed detailed rules for interpreting the FEV1 results and uses your most stable state of health values for determining whether or not you meet the listing. Even if you do not meet the listing for Chronic Obstructive Pulmonary Disease, your COPD may result in sufficient functional limitations to prevent you from performing your past work or any work in the national economy. At Louisiana Disability Law, we have experience obtaining disability benefits for clients with COPD. If you have COPD and need help applying for Social Security Disability benefits or need to appeal a denial, give us a call at 985-240-9773. What Is The Any Occupation Review? 2)After the 24 month period, Any Occupation. Your LTD benefits became effective 12 months ago. To continue receiving benefits after 24 months, you must be disabled from any occupation. Please be advised that we have initiated an investigation to determine if you will qualify for benefits after the 24 months have elapsed. We will notify you regarding our determination. What exactly does this mean? You were granted disability benefits because you couldn’t work. You still cannot work. What is the insurance company talking about here? Almost all (at least that I have seen) employer-provided long-term disability policies have a change in the definition of disability after you have been receiving disability benefits for 2-years (or 24-months). I have seen some that change after 1-year (or 12-months). The change is that you must be disabled from performing any occupation instead of just your own occupation. For example, if your occupation was a truck driver at a light-medium exertional level, your back injury may qualify you for long-term disability benefits initially. When the definition changes, the question is does your disability prevent you from doing ANY OCCUPATION – such as clerical work, inventory work, or other sedentary type occupations. The disability company understands that if you are entitled to benefits after this point in time, then chances are you will be receiving benefits for a long time. The disability company does not want this. 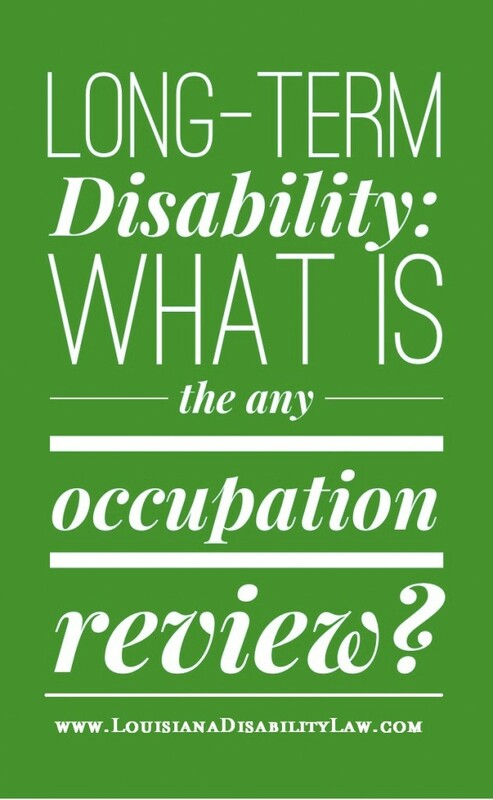 The “any occupation review” is done by the long-term disability insurance company at or around the time the definition of disability changes in your policy. The change in definition gives the insurance company an opportunity to deny perfectly valid disability claims under the guise of the claimant being able to perform some type of occupation. In doing their “any occupation review,” the insurance company will often use a vocational expert (VE) to opine on whether or not with your disability you can perform the substantial and material duties of another occupation. In some policies, the definition requires that you be suited for the occupation by age, education, training, or skill while others require that the occupation results in you earning, at least, a certain percentage of your pre-disability gross income. However, many policies place no restrictions on the type of occupation the insurance company can say you are qualified for. You can expect to receive a number of documentation requests and/or interviews in the months leading up to your 24th disability payment. 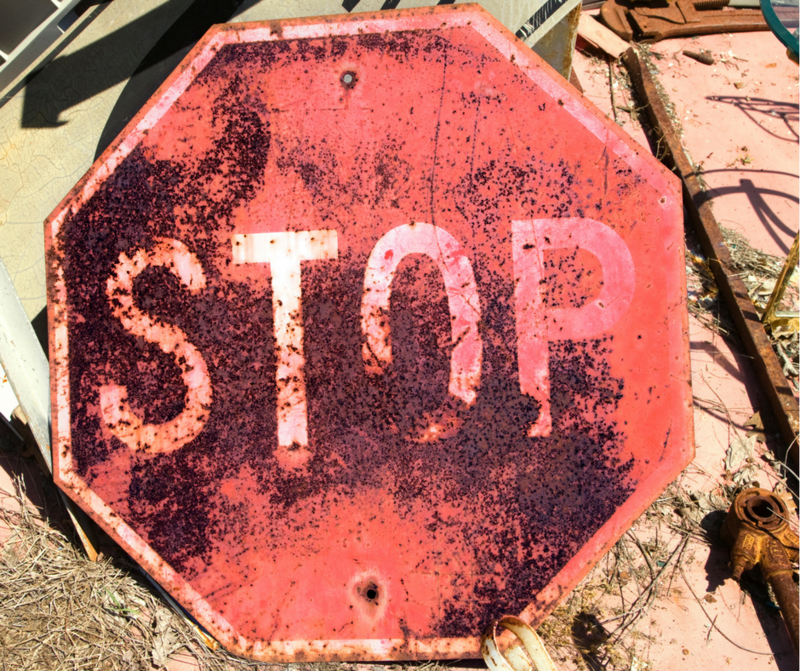 They all have one purpose — finding out what you can do so that they can get you off of claim, and/or bombarding you with so many requests that you may fail to turn one in and then your claim can be dismissed. You will be faced with a completely new inquiry into your disability. Basically, you will have to prove your disability again, but probably to a more detailed level. You will probably need to collect additional evidence of your disability and of your inability to perform the tasks the disability company now claims you can do. If you are lucky, the definition of disability in your policy will give you some added protections – such as you must be able to earn a certain percentage of your pre-disability earnings. It is important to maintain a good relationship with your doctor. Keep your journal/diary up to date. Make sure your family and friends know of your continued disability and can support your claims if needed. The unfortunate truth of the "any occupation review" is that many claimants are found by the disability insurance company to be capable of performing, at least, one occupation. Because of this, continued long-term disability benefits will be denied. If you are faced with an Any Occupation Investigation or Denial, you do not have to fight the insurance company alone. Mandeville long-term disability claimants faced with such a denial can call me for help. Successfully appealing any occupation denials takes creativity, hard-work, and a detail-oriented approach. If you live in Kenner, or anywhere in Louisiana, and are faced with an Any Occupation long-term disability denial, I may be able to help you. Give me a call at 985-240-9773 or use our simple contact form. What's the difference between Short-term and Long-term Disability? 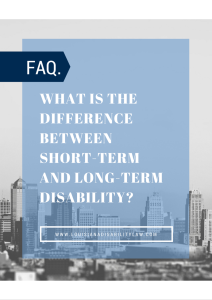 As a Louisiana disability lawyer, I have been asked to explain the difference between short-term disability benefits and long-term disability benefits on more than one occasion. This is my attempt to explain the differences and similarities as briefly as possible. Short-term disability insurance is designed to pay you benefits quicker and for a shorter period of time. The elimination period (the period of time you must be disabled before benefits start) in a short-term disability policy is often from 0-14 days. This means that a short head cold would probably not qualify you for short-term disability. The benefit period usually ranges from 60-180 days (or 2-6 months). This means that you will be paid, if you are disabled, for that period of time. The universe of ailments and injuries that can qualify you for short-term disability are greater than those for long-term disability because of this. For example, while a broken arm may not last long enough for you to claim a long-term disability, it could qualify you for a short-term disability benefit. For this reason, a short-term disability policy may be referred to as a sick-leave policy. Short-term disability policies do have terms, conditions, and exclusions that you must be aware of. The number of policies and differences makes it impossible to point them all out here. For this reason, you need to read the policy. Long-term disability insurance policies, on the other hand, are designed to replace a portion of your income over a longer period of time. For this reason, their elimination period (long-term disability waiting period) is usually longer – often 90-180 days (but policy specific). This means that you will not get paid for the first 3-6 months of your disability. Long-term disability policies can pay you a benefit for a very long time, as long as you are disabled – usually up to a certain age, like 65. The policy terms, conditions, and exclusions of long-term disability policies are often more onerous (bad for you) than short-term disability policy conditions. Also, because the benefit period is substantially longer, insurance companies carefully review and manage their long-term disability claims. I should also point out that just because the insurance company approved your short-term disability benefits does not mean they will approve your long-term disability claim. Long-term disability claim denials are common for those coming from short-term disability. From a legal perspective, I do not see many short-term disability disputes but they do exist. Long-term disability insurance disputes are more common. However, the legal principles applying to reviewing decisions of the insurance company under both short and long-term disability insurance are the same – if the benefits were provided by your employer. There may be a difference if you get one benefit through your job but paid for the other separately. I hope this brief explanation cleared up some confusion. If you want to discuss your short-term or long-term disability case, call me at 985-240-9773 or use our contact form. When can I/When should I apply for Social Security Disability Benefits? If you expect to be out of work for a year or longer or you have a terminal condition, you should not delay in filing a claim for Social Security Disability Insurance (SSDI) benefits. You may file your claim for SSDI benefits as soon as you become disabled. You must prove that your disability will last at least 12 months or is expected to result in death. You do NOT need to wait to apply until after you have already been disabled for 12 months. You can apply for Social Security Disability benefits online (www.ssa.gov) or at your local Social Security Office. See also blog posting: How long do I need to wait to apply for SSDI? How Long Should I To Wait To Apply For SSDI Benefits? The surprising answer is – YOU DON’T NEED TO WAIT!! You can file for social security disability benefits on the day that your doctor diagnoses you with a disability, or on the first day that you can no longer work because of your disability. Many people mistakenly believe that they must be disabled for a certain period of time before they can even apply for social security disability benefits. The longer you wait to file, the longer you will have to wait to receive your disability benefits if you are disabled. This is true for Houma social security disability claimants, Thibodaux SSDI claimants, and even those in Galliano applying for social security disability. In fact, it is true throughout Louisiana and the Nation. If you have a serious illness, disability, or impairment that will last at least a year (or is likely to result in death – like cancer or Lou Gehrig’s disease), you can apply on the day the illness, disability or impairment impacts your ability to work. Now, this does not mean, that if you have a minor illness or injury that will heal within one year, you need to rush out and apply. Don’t do it. Your claim will be denied, I cannot help you, and you will be taking up valuable resources needed by those truly disabled. Remember, a large number of disabled individuals, especially in Louisiana, are denied social security disability benefits when they first apply. Then they have to go through an appeal process, often including a hearing with a judge. Some even have to go to court to have their case approved. The process takes time. The longer you wait to apply, the longer it takes for the process to get started. 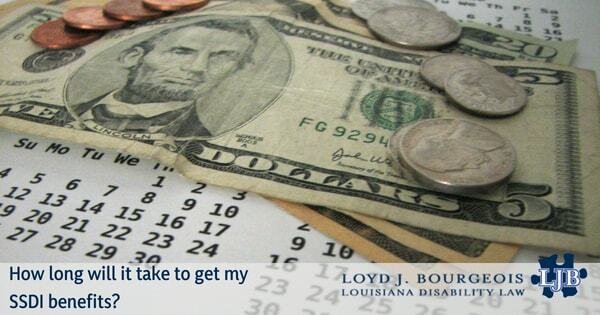 I usually recommend that my Louisiana disability clients apply for social security disability as soon as they can no longer work because of their disability to get the process started. 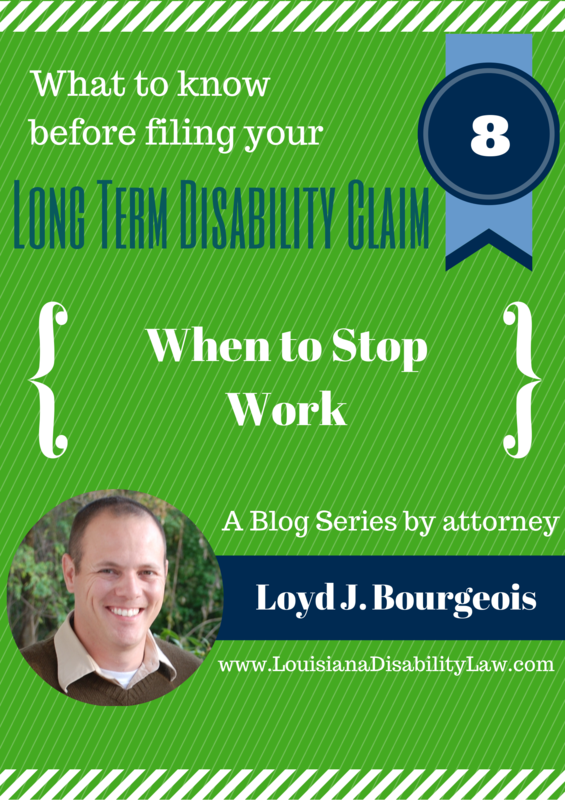 How long does it take to process a Louisiana Social Security Disability appeal? How long does it take to receive benefits after Social Security Disability approval? How long does it take for Social Security to make a decision on my SSDI claim? How Long Does It Take To Get SSDI Benefits After I Am Approved? Congratulations! Your social security disability benefits claim was approved. If you are like most of my Louisiana disability clients after your SSDI claim has been approved – you want to know WHEN WILL I GET THE DISABILITY BENEFITS I HAVE BEEN AWARDED? It will usually take a few months for your benefits to start – AFTER YOU RECEIVE A FAVORABLE WRITTEN DECISION. How long after approval for disability do you get your money? If you received a favorable decision on your initial application WOW – your benefits will start as soon as the paperwork is processed. You probably won’t have to work to obtain back benefits. Your benefits will probably start within 30-90 days, assuming that you have completed the 5 month elimination period. If your claim went through a hearing with an Administrative Law Judge, you will have to wait longer. ; Many ALJs in the New Orleans Social Security and Metairie Social Security hearing offices take about 1-3 months to issue their written decision. When the decision is favorable, the claim file is then sent to the payment processing center, where it can take another 1-3 months for current benefits to start. How long does it take to get back pay from Social Security? In some situations, Social Security issues current monthly benefits, but not the back payments. This is because they need to investigate if you received any Supplemental Security Income (SSI) benefits. If you also have a claim for SSI benefits, you will need to call or go to your local Social Security office for an appointment before your benefits can be released. Social Security does not have any specific rules on when they will pay you after being approved, but if you have not received your benefits 60 days after your hearing, give your local Social Security office a call. You can apply for social security disability benefits or supplemental security income benefits in a number of ways. If an office close to you is not listed, you can find the office that serves you by using Social Security’s Find An Office tool. You should be aware that the in person application, while the most thorough, can take a few hours between the waiting and the application. You should prepare to be there the whole day and have as many records as possible with you. You can also call in advance for an appointment at 1-800-772-1213. You can also apply for social security disability benefits online. When Should I Stop Work If Applying For LTD? You may not be disabled. In our previous installment, we talked about pre-existing conditions, waiting periods, and effective dates of coverage. Those are important topics to understand when you and your doctor are determining that you can no longer work. Are you sure that you are covered under your employer’s long-term disability policy? Did you fill out your election timely and has the waiting period passed? Are you beyond the pre-existing condition exclusion? These are just a few of the questions that impact whether or not you have coverage and are entitled to benefits at the time you can no longer work. If you have been following along, you know the importance of having your doctor diagnose your disabling condition. You also know that your policy contains a specific definition of disability. To get benefits under the policy, you must be disabled according to the definition. Most definitions will require that you could no longer work because of a disability. Unfortunately, some people stop working BEFORE their doctor diagnoses a disabling condition. When that happens, the person will have no medical proof of a disability until AFTER they stopped working. Sometimes, people file without any medical support. The long-term disability provider will have an easy decision – that person decided to stop working (quit). The person cannot prove that a disability caused their inability to work. Why? Because they have no medical opinion saying so. The medical opinion only comes after the decision to stop working. A good example here is the chicken and the egg. You know the one – which came first, the chicken or the egg? While there is no clear answer on the chicken or the egg, in long-term disability settings there is. You must have a doctor’s opinion and medical proof of disability BEFORE stopping work and filing a claim. You should only stop working after you are certain that you are covered under the long-term disability policy, and you have adequate medical support and documentation. And not before. Good luck. And, remember the things you need to know before you file your long-term disability claim. If you need help filing a disability claim or appealing a denial, we're here to help. Give us a call at 985-441-3448.